Justin Sullivan/Getty ImagesIt’s all about sales. Tesla reports third-quarter earnings after the bell on Wednesday. We’ll cover the results and also summarize CEO Elon Musk’s comments on the call the company holds with Wall Street analysts after the numbers are released. There’s significant pressure on Tesla this quarter and as the year closes out. The stock has been white-hot in 2014 and is up over 1,000% since the company’s 2010 IPO. But shares have been trading substantially lower over the past month and half and are down on Wednesday ahead of the close, at $US231. 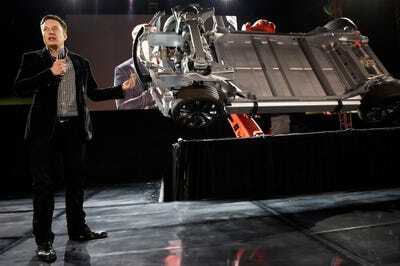 In October, Musk threw a great party in Los Angeles to roll out the all-wheel-drive version of the Model S sedan. But questions have arisen about Tesla’s sales pace, at least in the U.S., where there have been rumblings that demand is weakening. The Wall Street Journal reported as much several weeks ago, and Musk — naturally, on Twitter — quickly disputed the allegations that Tesla sales are slowing. So the picture heading into the fourth quarter is confusing. By the end of the day, we could have additional perspective on Tesla’s future, although on the earnings front, the automaker is expected to have an unimpressive quarter, compared to the same period in 2013. Kevork Djansezian/Getty ImagesCEO Elon Musk presents the all-wheel-drive Model S.
That’s changing, as analysts start to look at how the rubber meets the road. 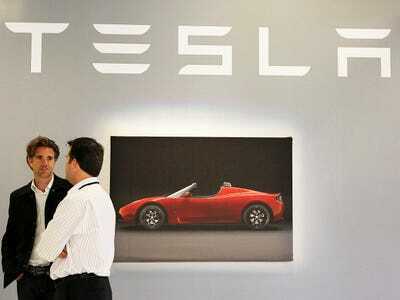 Tesla has said that it expects to sell 35,000 Model S sedans worldwide in 2014, with half of those in the U.S. If demand for the $US100,000 electric car is fading, then attention will shift to the launch of the next car, the Model X SUV, in 2015 — and then to the mass-market Model 3, in 2017. And Tesla will have to explain how it intends to satisfy investors while customers wait for those cars to be delivered.